Cloudamize’s top management (left to right): Founder and chariman Kushboo Shah, Cofounder and CTO Stephan Bohacek, and CEO Bob Moul. Last week's purchase by Blackstone-backed, UK-based Cloudreach of a controlling stake in Cloudamize has enriched some of the leaders of Philadelphia's modest-sized venture capital community. The yearly return on investment, gross of investment fees, was 52 percent, says George Krautzel, partner at MissionOG, the Market Street-based group of early-2000s tech-company founders that led Cloudamize's $1.2 million capital raising four years ago. 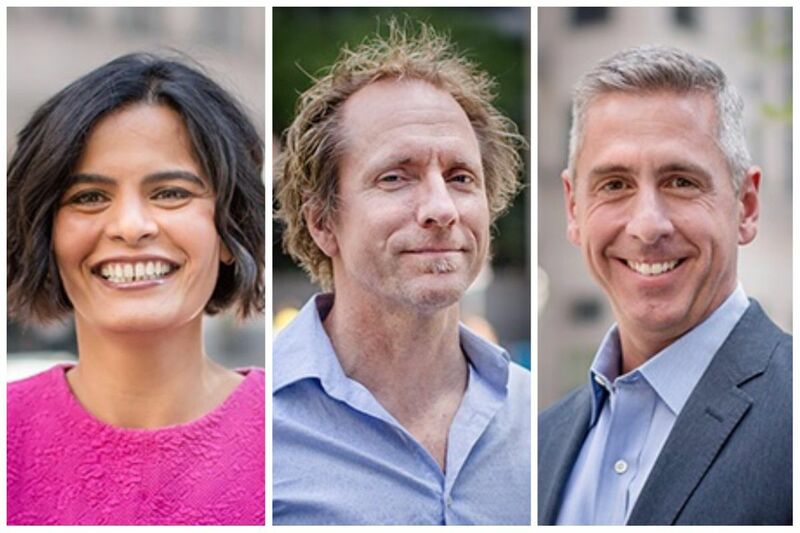 Other investors in the Center City-based cloud-computing corporate contractor started by data scientist Khushboo Shah and run by CTO Stephan Bohacek and serial tech CEO Bob Moul, included DreamIT, the fund that grew out of Philadelphia-founded DreamIt Ventures, and Gabriel Investments, the Center City founders' group assembled by consumer-marketing-wizard-turned-philanthropist Richard Vague, whose office is across Market Street from Krautzel's group. Total investment was around $3.2 million, most of it for convertible debt (it turns into equity as a company prospers), including a $1 million issue last year. "They did well on this. My hat's off to them," Michael DiPiano, managing general partner at NewSpring Capital, the Radnor-based venture firm that invests across the eastern U.S., and a sometime MissionOG coinvestor — though not on this deal — told me. It wasn't just smart and timely applications of capital, Krautzel says: "I am very proud of the Cloudamize team. Bob, Khushboo, and Stephan did a great job really building a market for cloud infrastructure analytics. We think the best days for the company are still in front of it, as they have significantly ramped commercialization over the past six quarters and created happy clients. The software platform helps enterprises assess, migrate, and manage their cloud infrastructure through detailed analytics." With Blackstone's backing, "we expect Cloudamize/Cloudreach to not only be a preferred vendor for cloud infrastructure management," but also to keep expanding beyond its couple of dozen Philadelphia staff. Krautzel says Blackstone's interest in Cloudamize "validates a MissionOG investment thesis that enterprises will accelerate the migration of applications and storage from data centers to public cloud, and will also require detailed analytics." Krautzel and MissionOG adviser Jonathan Palmer served on the Cloudamize board.